WEC Group is currently going through a nice spell of growth after investing over £2m in nine new, state-of-the-art machines as a way of strengthening its supply chain. 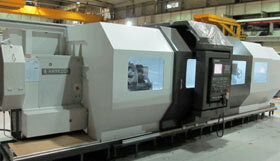 The new machining technology follows £3m of investments to relocate WEC Machining to a 33,000 sq. ft. production facility in Blackburn, Lancashire with plenty of room for future expansion. WEC Machining now has 6 brand new Haas Machining Centres, an Asquith Butler 8M Machining centre and a Hancook Oil Country Lathe available in-house. We also brought in a 7 axis Citizen Sliding Head Lathe with 4 metre bar feed and up to 32mm diameter, making it possible for the division to machine large batches of small turned parts at extremely competitive rates. This new machining technology is a welcome addition to the division's already extensive capacity list which includes 30+ CNC machines, a large 5 axis mill turn centre and two cutting edge precision engineering workshops. As the division continues to take on more work, more jobs are being created and new shift patterns are being introduced to enhance productivity and significantly reduce lead times. WEC Machining recently appointed a brand new Operations Manager as well as a Production Planner and is hoping to create a further 20 jobs in the near future, including additional apprentices. Continuous investment in new technology is the key to WEC Group's dramatic growth over the past few years. The group has already invested over £3m in new machinery since the start of 2015, including a a second Fibre laser machine, a new 7m x 2.4m dynamic waterjet cutting machine and a £500,000 fully automated powder coating plant able to powder coat components up to 1.5m high x 2.5m long x 800mm wide. WEC Group currently employs over 600 staff and has manufacturing sites in Blackburn, Leeds, Sheffield and Liverpool. The company comprises of 14 specialist divisions spread across 500,000 sq. ft of production facilities.